The U.S. men’s basketball team takes on Argentina in one semifinal, while Spain and Russia meet in the other. Gold medals are handed out in men’s and women’s BMX. And six events — men’s pole vault, women’s hammer throw, women’s 5,000 meters, women’s 4×100 relay, women’s 1,500 meters and men’s 4×400 relay — will be decided in track and field. What else should you be watching? Consult today’s viewer’s guide. Men’s wrestling — freestyle gold medal finals in 55 kg and 74kg weight classes (2:45 p.m.). Men’s water polo — a semifinal match. Women’s field hockey — gold medal match: Netherlands vs. Argentina (6 p.m.). Men’s handball — semifinal match: France vs. Croatia (4:30 p.m.). Men’s soccer — bronze medal match: Japan vs. South Korea (Live at 2:45 p.m., Replays at 4:30 p.m. and 10 p.m.); Women’s soccer — Thursday’s gold medal match: United States vs. Japan (6:15 p.m.); Women’s soccer — Thursday’s bronze medal match: Canada vs. France (8 p.m.). Packaged Spanish-language coverage includes rhythmic gymnastics qualifying, men’s boxing semifinals, men’s volleyball semifinals, synchronized swimming, men’s basketball semifinals and men’s soccer bronze medal match. Fabulous! Great passes, great team. U.S. destroys a world record from the steroid-addled 1980s..
Feel-good moment for the Yanks. Advertisers love to feature Olympic athletes in their ads–even if the athletes didn’t make the Olympics. Coca-Cola probably thought it had a sure bet with that last spot, starring American high hurdles record holder David Oliver. Except Oliver didn’t make the U.S. team this year. Ditto 2008 decathlon gold medalist Bryan Clay, who’s in just about every other ad. Oops. Maybe Dow is on to something with that Giant Green Guy; he won’t get injured or beaten. Probably. Maybe I’m the only person in America who wants to see an ENTIRE 5,000-meter race, not just the beginning and end, but these commercial interruptions has always irritated me. Distance races aren’t just about the last lap, NBC. Signed, Frustrated…. I am signing off for the night. I’ll be back here in the live blog beginning Sunday at 8 p.m. ET to revel in the pageantry and (hopefully) the Posh Spiceness of the closing ceremonies. U.S. 4 x 100 team throws down a 37.3 WITHOUT Tyson Gay. Well, maybe this final could be interesting. Suggestion to U.S.: Hold on to the baton. The Wall Street Journal posted an interesting piece today on the growth of the Twitter followings of various Olympic contenders. Not surprisingly, several of the American athletes saw massive expansions of the audiences hanging on their every hash tag. Gabby Douglas experienced the biggest social media growth spurt; she now has more than 614,000 followers, an increase of 1,522% over where she stood on Twitter before the games began. The Journal piece says that Missy Franklin, Jordyn Wieber and, yes, Ryan Lochte ran just behind her in terms of gaining followers. So for those wondering how to raise their social media profiles, the answer is simple: become very good at a sport, spend years training until you are exceptional at it, qualify to compete in the Olympics, do well enough to win a medal, then watch the Twitter followers flock to your feed. Yes. This really is the easiest way to go about it. Should we even bother running the final of this race tomorrow? 37.3 WITHOUT Usain Bolt on the anchor? Fuhgedabowdit. Is Mary Carillo doing an Olympics segment on “Downton Abbey” right now? I don’t know whether to cheer, serve tea or wonder what the heck is going on with NBC’s coverage. Honestly, to save time, they should have merged the Dream Team retrospective with this pseudo-“Downton Abbey” segment, which finally would have allowed us to see Lady Mary Crawley and her Matthew try to pull off a pick-and-roll versus Jordan and Magic. There are many things to admire about watching diving during the Olympics, including, most notably, seeing all those toned bodies shoot like elegant, spandex-clad missiles into the water. But aside from the obvious — the actual diving — there are three things I love about the coverage of Olympic diving. 1. The underwater camerawork: It’s one thing to see the divers doing their handstands on the platform or triple somersaulting in the air. But watching what happens when they plunge into the water brings a full sense of closure to the experience. Plus, there’s always a chance that someone’s Speedo will get knocked clean off. This, ladies and gentlemen, is why all eyes must remain on the television when a dive is in progress. 2. The splash-ometer: I love the tiny graphic that measures the quality of the splash levels achieved by each competitor. I like it almost as much as the arrows that helped me understand whether the female gymnasts’ scores were positive, really horrendous or just eh. I’ll have more to say about this in tomorrow’s Style section (online very soon). I understand why NBC is reminding us of the greatness of the original Dream Team. It’s been 20 years since these contenders — the first men’s basketball team to compete in the Olympics with NBA players — won their gold medal. This retrospective also provides a great opportunity to see Charles Barkley and Michael Jordan decked out in some really fabulous shirt wear. But given how much is happening in the present, at the Olympic games that are going on now, should we really be having a flashback in primetime for the first 23 minutes (and counting) of coverage? Really? I didn’t switch to ESPN Classic, did I? I, Jen Chaney, am here, along with the astute Paul Farhi, to post insights, information and gold-medal-worthy commentary for the next couple of hours of NBC’s Olympics broadcast. Pretend you don’t know who won any of these events. Come on. It’ll be fun, like you’re Colin Farrell in the first part of “Total Recall,” before his memories come back. Bryshon Nellum will carry the U.S. flag at Sunday’s Closing Ceremonies. The 400-meter runner was selected by his fellow members of the U.S. Olympic team. Nearly four years ago, Nellum was shot three times in the legs in a case of mistaken identity. Doctors told him at the time that there was a chance he might never run again at an elite level. But in London, Nellum advanced to the semifinals of the 400 meters and was part of the U.S. team that won a silver medal in the men’s 4×400 relay. “I’m humbled by this incredible privilege,” Nellum said in a statement provided by the USOC. With the bout tied at 10 after two rounds, Roberto Cammarelle of Italy outscored Magomedrasul Medzhidov of Azerbaijan in the decisive third to advance to the gold medal bout in the super heavyweight division. Cammarelle will face Anthony Joshua of Britain, who eliminated Ivan Dychko of Kazakhstan, 13-11, in the other semifinal. The losers of both semifinals automatically earn bronze medals. GALLERY: Click on the image above to see photos of some of the top stories of these Olympics. Egor Mekhontcev of Russia handily defeated Yamaguchi Falcao Florentino of Brazil, 23-11, to advance to the final in the light heavyweight division. Park Chu-young and Koo Ja-cheol scored as South Korea beat Japan, 2-0, in Cardiff to claim the bronze medal in men’s soccer — the first medal for the Koreans in Olympic soccer competition. It was also the first men’s soccer medal by an Asian team since Japan won the bronze medal in Mexico City in 1968. Brazil and Mexico meet in the gold medal final on Saturday at 10 a.m. ET. Carmelo Anthony caused his teammates to leap and dance Thursday afternoon, burying three straight three-pointers in the fourth quarter as the U.S. men’s basketball team pulled away to a 109-83 victory over Argentina in an Olympic semifinal. The United States will face Spain — which they beat in the final game in 2008 in Beijing — for gold on Sunday. Kevin Durant of Suitland, Md., led the Americans with 19 points, and Anthony and LeBron James added 18 apiece for the United States, which buried Argentina with three-pointers. The Americans hit 17 of 41 from beyond the arc, and Anthony’s run early in the fourth helped continue a rout that began in the third quarter. The U.S. beat Spain 118-107 in the gold medal game four years ago. The only concern for the Americans: With under four minutes remaining in the game, reserve guard Russell Westbrook limped off the court and to the locker room. Thanks everyone for the goodlucks tomorrow. Dreaming of Gold tonight. My next tweet will be a picture of me holding that Gold medal!!! Freddie Evans of Britain lost the third round but won his welterweight semifinal over Taras Shelestyuk of Ukraine, advancing to Sunday’s gold medal final. Evans will face Serik Sapiyev of Kazakhstan, an 18-12 winner over Andrey Zamkovoy of Russia. Qiu Bo of China took the lead in the preliminary round of the 10-meter platform with a stunning second dive, a handstand triple somersault, and never relinquished it. The rest of the field, however, was changeable through much of the competition, which took more than three hours as 32 divers each performed six dives at the Aquatics Centre. When it was over, Qiu’s countryman, Yue Lin, had wrestled the second spot from a bevy of challengers. Placement wasn’t as important as making it into the top 18 and advancing to Saturday’s semifinals. In the third and fourth spot were Germans Sascha Klein and Martin Wolfram. Mexico’s German Sanchez Sanchez and Ivan Garcia Navarro, who partnered to win silver in the synchronized platform event here, were in fifth and sixth. Britan’s Thomas Daley had a quixotic day. He slowly climbed the leaderboard into ninth after three dives and seventh after four. His fifth five, however, was a disaster – a back 3 ½ somersault that earned just 39.60 points. He needed a solid sixth dive to move on, and he got it, scoring an 84.15 with a reverse 2 ½ somersault – to the relief of the partisan crowd. American Nick McCrory, who with David Boudia won bronze in the synchronized platform event, finished seventh and very nearly moved on without his diving partner. Boudia was in eighth place after three dives, but a catastrophic score on his fourth dive – 44.55 – hurt his chances, and when his final dive netted just 70.20 points, he could only watch the scoreboard and hope. He squeaked in at No. 18. Friday’s scores are erased, and Boudia and the rest can start afresh Saturday. Kevin Durant hit four three-pointers in the third quarter alone, and LeBron James continued to help his team all over the court, as the U.S. men’s basketball team built a 74-57 lead over Argentina in the semifinals of the Olympic men’s basketball tournament through three quarters. James leads the Americans with 18 points, while Durant has 16. Kobe Bryant has 13. The Americans extended a seven-point halftime lead to 59-46 when Durant knocked down a three-pointer with 6:28 left in the quarter. But the United States also grew too happy to take long-distance shots. On one possession, after Argentina had climbed back within eight, Durant, Carmelo Anthony and Deron Williams all took, and missed, threes. So James slashed to the basket to get the Americans back in rhythm. On consecutive possessions, he scored on a drive and a dunk — the latter an old-fashioned three-point play — to build the lead back to 13. Durant then hit back-to-back three-pointers, and when James scored on a tip-in, the United States had its biggest lead at 72-53. France’s Renaud Lavillenie cleared 5.97 meters (19 feet 7 inches) in the pole vault, setting an Olympic record and winning the gold medal. A pair of Germans, Bjorn Otto and Raphael Holzdeppe, both cleared 5.91 meters, but Otto took silver on the basis of fewer misses. The lone American in the field, Brad Walker, failed to clear a single height. The Netherlands beat Argentina, 2-0, to win the gold medal in women’s field hockey at Riverbank Arena. Carlien Dirkse van den Heuvel and Maartje Paumen scored for the Netherlands, the defending gold medalists. Both goals came on penalty corners. Italy defeated Serbia, 9-7, in a semifinal of the men’s water polo tournament, advancing to the gold medal match Sunday vs. Croatia. Valentino Gallo scored three goals for the Italians. Montenegro and Serbia will play for the bronze, also on Sunday. LeBron James, who has generally tended to passing and defending during the Olympic tournament, made an offensive push in the second quarter of the U.S. men’s basketball team’s semifinal against Argentina, helping the Americans to a 47-40 halftime lead. After a typically quiet first quarter — James came into the game averaging only 11.5 points per game during the tournament — he all but took over as Argentina put pressure on the United States. In a two-and-a-half-minute span, James drove for one basket, slashed through the lane and took a feed from Chris Paul for another, used a nice move to free himself underneath for the next, then drove and was fouled. That gave him nine points in that run as the U.S. built a 37-27 lead. The United States, the only undefeated team remaining in the tournament, closed the half with an outstanding pass from James to Kevin Love for a layup. But Manu Ginobili’s three-pointer at the buzzer kept Argentina within seven. Soonchul Han of Korea took an 18-13 decision over Evaldas Petrauskas of Lithuania in the lightweight semifinals, advancing to Sunday’s gold medal bout. Han will face Vasyl Lomachenko of Ukraine, a 14-11 winner over Yasnier Toledo Lopez of Cuba. U.S. anchor Angelo Taylor got run down in the homestretch by Bahamas anchor Ramon Miller, who finished Friday night’s final in a national-record time of 2 minutes, 56.72 seconds. The United States got second in 2:57.05, and Trinidad and Tobago got the bronze in 2:59.40. The United States was missing LaShawn Merritt, the 2008 Olympic gold medalist in the 400, and Jeremy Wariner, the ’08 silver medalist. Both had been felled by injuries. The squad advanced only because American Manteo Mitchell completed his leadoff leg in the heats despite breaking his fibula about halfway through. Friday’s race also featured South African double-amputee Oscar Pistorius in his Olympic final debut, but the South African squad, which won the silver medal at last year’s world championships, was not competitive. Pistorius, who ran the anchor leg, got the handoff well last among the competing teams, and South Africa finished eighth in 3:03.46. Cuba did not finish. Russia’s Tatyana Lysenko set an Olympic record in winning the women’s hammer throw with a mark of 78.18 meters (256 feet 6 inches). Poland’s Anita Wlodarczyk won silver (77.60 meters) and Germany’s Betty Heidler took bronze (77.13 meters). No Americans advanced to the final. Brazil will meet Russia Sunday in the final of the men’s volleyball tournament. Brazil advanced with a 3-0 victory over Italy in the semifinals. Russia ousted Bulgaria, 3-1. The semifinal losers will play for the bronze medal, also on Sunday. Kobe Bryant scored 11 points, including three three-pointers, to give the U.S. men’s basketball team a 24-19 lead over Argentina Friday night at North Greenwich Arena in the semifinals of the Olympic tournament. After falling behind 4-3, the Americans ran off 12 straight points, a run that started with a spectacular baseline move from Bryant and then included three-pointers from Chris Paul, LeBron James and Bryant. When Argentina finally called time out less than four minutes into the game, it already trailed 15-4. But Argentina immediately worked its way back into the game, closing the gap to 19-17 on two free throws from Juan Pedro Gutierrez with 1:27 left in the quarter. But reserve Russell Westbrook then scored on a drive, and Deron Williams drilled a three-pointer — the Americans’ sixth of the quarter — to stabilize the United States. Paige McPherson won a bronze medal in the 67 kg taekwondo division with an 8-3 victory of Franka Anic of Slovenia. McPherson had lost in the quarterfinals to Nur Tatar of Turkey, but when Tatar advanced to the gold medal match, McPherson got a second chance in the repechage. She won that match against Andrea St. Bernard of Grenada. McPherson knocked out British world champion Sarah Stevenson in the first round. Turkey’s Asli Cakir Alptekin claimed her country’s first gold medal in track and field with a victory in the women’s 1,500 meters. She finished with a time of 4 minutes 10.23 seconds, just ahead of countrywoman Gamze Bulut, who ran a 4:10.40. Maryam Yusuf Jamal of Bahrain won bronze in 4:10.74. American Shannon Rowbury was sixth with a time of 4:11.26. The lasting image of the race, however, is likely to be that of American Morgan Uceny, who got tangled up and fell heading into the bell lap. She pounded the track in frustration and did not finish. A similar fate befell Uceny at last year’s world championships. Tugstsogt Nyambayar of Mongolia advanced to the gold medal bout in the flyweight division Friday with a 15-11 decision over Misha Aloian of Russia. Nyambayar will face Cuban Robeisy Ramirez Carrazana, who downed Ireland’s Michael Conlan, 20-10, in the other semifinal. The flyweight final will be Sunday. Paige McPherson won her repechage match against Andrea St. Bernard of Grenada and will take on Franka Anic of Slovenia for a bronze medal in the 67 kg taekwondo competition. McPherson knocked out British world champion Sarah Stevenson in the first round, but lost to Nur Tatar of Turkey in the quarterfinals. When Tatar advanced to the gold medal match, that gave McPherson a second chance at a bronze medal. Carmelita Jeter turned her head toward the track clock, stretched out her arm and pointed the baton at the time even before she reached the finish line. She knew: the U.S. women’s 4×100 relay team hadn’t merely secured a gold medal, it was about to claim a jaw-dropping world record. Tianna Madison, Allyson Felix, Bianca Knight and Jeter got the stick around in 40.82 seconds, obliterating the 27-year-old record of 41.37 held by a 1985 team from East Germany. Jeter was so elated by the performance, which came not long after the U.S. men’s 4×100 relay team broke a 19-year-old American record in the heats, she barely slowed down after passing the finish. She ran screaming and sprinting around the turn, going so fast she blew by Madison, who was rushing toward her to try to celebrate. The performance also broke the 1980 Olympic mark of 41.60, also held by East Germany. It also represented the first Olympic medal in the event for the U.S. women, which have been beset by years of bad handoffs and disqualifications, since the 1996 Summer Games in Atlanta. Jamaica finished second in the event in a national-record time of 41.41 seconds. Ukraine also set a national record with its bronze-medal finish in 42.04. When Usain Bolt won gold and broke the world record in the 200 meters in Beijing, he called what would become his signature stance ‘To the World.’ Following a repeat victory in the 200 on Thursday, the world (or the Twitterverse, at least) responded by striking the ‘lightning’ pose in his honor. Check out some of the best Instagram and Twitpics capturing the ‘lightning’ over at Style Blog. TweetTake a picture of yourself posting like Usain Bolt, then share it with us on Twitter by using the hashtag #LikeABolt. We’ll post your responses right here. Ethiopia’s Meseret Defar used a strong finishing kick to claim the gold medal in the women’s 5,000 meters — reclaiming a title she won in Athens in 2004. Defar was just behind countrywoman Tirunesh Dibaba heading into the final lap, then surged ahead as the race entered the final stretch. She finished in 15 minutes 4.25 seconds. Dibaba, who won the 10,000 meters last Friday and was the defending Olympic champion in the 5,000, faded and finished third in 15:05.15. Vivian Jepkemoi Cheruiyot of Kenya took the silver medal in 15:04.73. This is the third straight Olympics that Defar and Dibaba have won a medal in the 5,000: Defar has two golds and a bronze, while Dibaba has one gold and two bronzes. Jordan Burroughs captured the United States’ first wrestling gold medal at these Games, defeating Iranian Sadegh Saeed Goudarzi, 3-0, Friday in the 74kg freestyle class. Burroughs advanced to the final by beating Denis Tsargush in the semifinals. on his way to the world championship last year, will face Iran’s Sadegh Saeed Goudarzi for the gold medal at 2:50 p.m. Goudarzi defeated Gabor Hatos of Hungary in the semifinals. Burroughs defeated Francisco Soler Tanco of Puerto Rico in the round of 16, Matthew Judah Gentry of Canada in the quarterfinals and Denis Tsargush in the semifinals. Burroughs also beat Tsargush on his way to last year’s world championship. Spain has already advanced to Sunday’s Olympic gold medal game. At 4 p.m., the United States and Argentina will play for the remaining spot in the second semifinal of the men’s basketball tournament at North Greenwich Arena. The United States is the only remaining unbeaten team, winning its six games by an average of 37.3 points. Argentina, which lost to both France and the United States in group play, advanced to the semifinals with a difficult 82-77 victory over Brazil. The Argentinians have two of the three highest-scoring players in the tournament — Luis Scola at 19.7 points per game and Manu Ginobili at 19.3. Kevin Durant and Carmelo Anthony pace the Americans at 17.8 and 17.3 points per game, respectively. These are the two top shooting teams in the tournament as well, with the U.S. hitting 52.7 percent of its shots and Argentina 48.6. Qiu Bo of China performed a stunning armstand triple somersault on his second dive to take the lead in the preliminary round of the 10-meter platform diving Friday at the Aquatics Centre. Qiu, the world champion in this event a year ago, scored a 99.75 on the dive to take the spot from Mexico’s German Sanchez Sanchez, who led after the first round. Americans Nick McCrory and David Boudia, the bronze medalists in the synchronized platform event, were in ninth and 10th places, respectively. The men perform six dives and the top 18 move into Saturday’s semifinals. The final will also be held Saturday. Justin Gatlin, the Olympic 100-meter bronze medalist, not only brought the United States across the finish line first — and with baton securely in hand — in the heats of the 4×100 relay Friday night, but he also helped the U.S. men break a 19-year-old American record. Jeff Demps, Darvis Patton, Trell Kimmons and Gatlin stunned even themselves when they got the stick around faster than the record-setting ’92 U.S. team anchored by Carl Lewis and the ’93 squad anchored by Leroy Burrell. The U.S. men finished in 37.38 seconds, topping the record by 0.02 seconds. The victory also put the U.S. men in position to win their first Olympic medal in the event in 12 years. 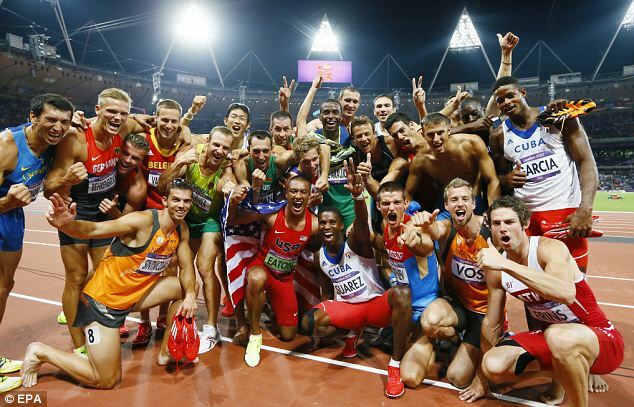 The U.S. men’s 4×100 relay team has failed to pass the baton cleanly or avoid disqualification in the last two Olympic Games and two world championships. The team’s last success came at the 2000 Games in Sydney — and then the victorious team drew rebuke for carrying on with an unsportsmanlike celebration. Mike Marsh, Burrell, Dennis Mitchell and Lewis hit the previous record time at the 1992 Games in Barcelona; Jon Drummond, Andrew Canson, Mitchell and Burrell did it again in Stuttgart in 1993. In the earlier heat, Jamaica — which featured 100-200 silver medalist Yohan Blake running the third leg — posted the fastest time of the year (37.39) until the U.S. team showed up. Next were Great Britain (37.93) and Canada (38.05). The U.S. team of Keshia Baker, Francena McCorory, Diamond Dixon and three-time Olympian DeeDee Trotter easily advanced to the final of the 4×400-meter relay with a dominant performance in Friday’s heats at Olympic Stadium. The U.S. women finished in 3 minutes 22.09 seconds, topping Russia (3:22.09) and Britain (3:25.05), which drew huge cheers from the crowd. In an earlier heat, Jamaica’s team came home in 3:25.13, leading Ukraine (3:25.90) and France (3:25.94). Dzhamal Otarsultanov of Russia defeated Georgia’s Vladimer Khinchegashvili in the 55kg freestyle wrestling gold medal match. Out of sync for much of the past two weeks, their big men bordering on lazy at times, Spain’s basketball team looked nothing like the high-octane offensive powerhouse that challenged the United States for the gold medal in Beijing four years ago. That team showed up at the North Greenwich Arena as unmotivated as ever, falling behind by 11 points at halftime to Russia, the upstart team of the Olympic basketball tournament. But then, out of nowhere almost, the Spaniards of old returned. Pau Gasol and Jose Calderon scored 16 14 points apiece, respectively, Rudy Fernandez added 11 and Spain completed a rousing second-half comeback with a 67-59 victory over Russia in the semifinals. Before its flag-waving, “O-le” chanting compatriots, Spain nearly ran the Russians off the floor with a blend of inside and outside play that erased a 31-20 halftime deficit by the end of the third quarter. Spain captured the lead with less than eight minutes left after Andrei Kirilenko picked up his fourth foul and never looked back. Kirilenko missed four free throws in the fourth quarter, encapsulating the Russians’ collapse. Marc Gasol passed out of the double team down low, finding Calderon for long three-pointers, and the Spanish clamped down defensively on the outgunned Russians. With the victory, Spain will play for gold medal for the second straight Olympics. The Spanish lost to the U.S. in Beijing. The Spaniards spoiled a possible gold-medal showdown between Russia and the United States, which plays Argentina in the late semifinal, 40 years after the Soviet Union controversially defeated the Americans at the 1972 Munich Games. Right winger Niclas Ekberg scored six goals as Sweden defeated Hungary, 27-26, to advance to the men’s handball gold medal match. Sweden, which is searching for its first handball gold medal after losing in the final in three straight Olympics from 1992 to 2000, will play either France or Croatia (3:30 p.m.) in the gold medal match. Ekberg now has 44 goals in the tournament, tops in the Olympics. Croatia jumped out to a 5-1 halftime lead and held off Balkan rival Montenegro for a 7-5 win in the men’s water polo semifinals. Croatia will play the winner of the Italy-Serbia semifinal (2:50 p.m.) in the final. Sandro Sukno scored two goals and Josip Pavic recorded 13 saves for Croatia, which avenged its loss to Montenegro in the quarterfinals four years ago. Croatia, which defeated the United States in the semifinals, is undefeated so far in London. Spain’s Queen Sofia, that is. She, along with Crown Prince Felipe and his wife Letizia, are at North Greenwich Arena watching the men’s basketball semifinal between Spain and Russia. Andrei Kirilenko, the most established player professionally on the Russian team, picked up his fourth foul with less than eight minutes in the semifinal game vs. Spain Friday night in the Olympic basketball tournament. Immediately after the former Utah Jazz forward left the floor, Spain captured its first lead of the game. With 6:46 remaining, the Spanish lead 53-49. The returning silver medalists from Beijing have had a rocky tournament, losing to Russia in group play and never resembling the cohesive, potent unit that put a scare into the Americans four years ago. But with the North Greenwich full of anxious Spanish fans, they took control in the third quarter and applied pressure defense throughout. Jose Calderon hit a deep three-pointer on the left wing with time running down, a shot that drew Spain even with Russia at the end of the third period, 46-46, for the right to play in Sunday’s gold medal game. Trailing 31-20 entering the third quarter with no offensive semblance, the Spaniards moved the ball more efficiently and finally got Pau Gasol involved down low. Spain outscored the Russians 26-15 in the quarter. An underdog all tournament long, Russia was holding onto to a slim lead over Spain in the semifinals of the men’s basketball tournament at North Greenwich Arena. The score is tied at 46 at the end of the third quarter. Spain trailed 31-20 at halftime, getting little offense from the Gasol brothers, Pau and Marc. Russia’s half-court execution also slowed the game, putting the more up-tempo Spaniards on the defensive. But Pau Gasol’s jumper with less than three minutes left in the quarter cut the margin to 44-41. The winner plays the winner of the United States-Argentina semifinal in Sunday’s gold medal game. Britain defeated New Zealand, 3-1, for the women’s field hockey bronze medal, its first Olympic medal in the sport since the 1992 Barcelona Games. With the Duchess of Cambridge in attendance, Alex Danson, Sarah Thomas and Crista Cullen scored for Britain. It was New Zealand’s highest women’s field hockey finish ever. Sasha Kaun has four points and Russia has a 12-9 lead over Spain after a cold-shooting first quarter in the men’s basketball semifinals. Spain shot 3 of 15, including 1 of 7 on three-pointers. Russia wasn’t much better, shooting 5 of 18. A team comprising Russian players has not won a men’s basketball medal since 1988, when the Soviet Union took the gold in Seoul. Spain won silver at the 2008 Beijing Games, losing to the United States in the final. Colombia’s Mariana Pajon and Maris Strombergs of Latvia won gold in the women’s and men’s BMX competition, respectively. Pajon, a former world champion who carried the Colombian flag during the Opening Ceremonies, posted a time of 37.706 seconds for her final run, which gave Colombia its first gold medal of the London Games. New Zealand’s Sarah Walker was second in 38.133 and Laura Smulders of the Netherlands won bronze in 38.231. Strombergs, who won the gold medal in Beijing when BMX racing made its Olympics debut, repeated as champion with a time of 37.576 in the final round. Australia’s Sam Willoughby, the reigning world champion, won silver (37.929) and Colombia’s Carlos Mario Oquendo Zabala took bronze (38.251). Oleksandr Usyk of Ukraine easily moved into the gold medal match, outpointing Bulgaria’s Tervel Pulev, 21-5, Friday in the heavyweight semifinals. Usyk will face Italy’s Clemente Russo in Saturday’s final. Russo narrowly defeated Teymur Mammadov of Azerbaijan, 15-13. Five more semifinals are to be contested Friday, beginning at 3:30 p.m. ET. The perfectionist Russian synchronized swim team rocketed to a gold medal in the team finals Friday morning at the London Aquatics Centre. It was not unexpected. Faster, stronger and seamless, the eight-woman team scored a total of 197.03 (of 200). Swimming to dark, heavy-thumping music, they were uncharacteristically unsmiling. Until their scores were announced, of course. Winning silver was China, with their “Butterfly” routine that included a fantastic one-armed lift and some intentional belly-flops. Pain for points. They scored 194.01. The bronze medal went to Spain, outfitted in silvery fish-scale bathing suits and caps, was delightful to watch with some unusual moves meant to emulate schools of fish. A couple of small technical missteps likely contributed to their 193.12 score. Canada, a crowd favorite with their soccer routine in Thursday’s preliminary event, went all Cirque du Soleil today but couldn’t pull out of fourth place. They ended with 189.63. Also competing were Australia, Egypt, Great Britain and Japan — all significantly less practised (that’s British) than the top four teams. The U.S. did not field a team for the event, although the U.S. duo of Mary Killman and Mariya Koroleva competed in the duet event earlier this week. See our photo gallery of the 2012 Olympic synchronized swimming highlights here. Read our full synchronized swimming coverage here. Spain defeated the U.S. men’s water polo team, 8-7, relegating the Americans to eighth place in the Olympic tournament. Felipe Perrone Rocha scored three goals for Spain; Jeff Powers and Layne Beaubien had two each for the United States. Paige McPherson of the United States, who upset world champion Sarah Stevenson earlier Friday, lost to Nur Tatar of Turkey in the 67kg taekwondo quarterfinals, 6-1. McPherson can still win one of the two bronze medals if Tatar advances to the gold medal match. Two-time Olympic champion Steven Lopez, who lost earlier Friday to to Ramin Azizov of Azerbaijan in the men’s 80kg preliminaries, will not compete for one of the bronze medals after the top-seeded Azizov lost to Mauro Sarmiento of Italy in the quarterfinals. Anthony Ogogo, Britain’s favorite middleweight, was eliminated in the semifinals Friday by Esquiva Falcao Florentino of Brazil, 16-9, and will settle for a bronze medal. Florentino will face Murata Ryota of Japan, who won silver at the world championships a year ago. He defeated Abbos Atoev of Uzbekistan, 13-12. Florentino and Ryota will meet for gold on Saturday. Ukraine’s Denys Berinchyk scored 17 points in the third round of his light welterweight bout against Munkh-Erdene Uranchimeg of Mongolia to advance to the final with a 29-21 victory. Uranchimeg had a 15-12 lead before Berinchyk’s explosion in the third round. The Ukrainian will face Cuban Roniel Iglesias Sotolongo in Saturday’s gold medal bout. Sotolongo defeated Vincenzo Mangiacapre of Italy, 15-8. Jordan Burroughs of the United States stopped Denis Tsargush of Russia in the 74kg freestyle wrestling semifinals, keeping hopes alive for a first U.S. wrestling gold medal at these Games. Burroughs, who also beat Tsargush on his way to the world championship last year, will face Iran’s Sadegh Saeed Goudarzi for the gold medal at 2:50 p.m. Goudarzi defeated Gabor Hatos of Hungary in the semifinals. The probable medalists are at the end of the lineup in today’s synchronized swimming team finals at the London Aquatics Centre. The swimmers — eight teams of eight women each — are being judged on technical merit and artistic impression. Those scores are combined with yesterday’s preliminary marks; the top score is 200. So far, Great Britain has been impressed with big heights on lifts; Japan’s ability to keep synced even when the swimmers are squeezed tightly together; Australia’s crowd-pleasing music choices; and Egypt’s circle-swim which looked lovely from a birds-eye camera. Japan, ranked fifth in a field of eight after the preliminary technical competition on Thursday, likely won’t make it to the podium, for the first time in years. Their score today was 187.63. Great Britain, the crowd favorite, made their very first showing in the team competition and scored 175.44. Lifts of about 10 feet helped their technical score. The Australian team, ranked dead last in yesterday’s event, swam to an AC/DC classic and ended with a total scored 154.93. Egypt, which ranked next-to-last in the preliminary technical competition on Thursday and were adorably excited about it, barely surpassed Australia with 155.96. Canada charmed the preliminary crowd yesterday with their soccer-ball bathing suits, but ranked fourth. Still, they might be able to wrestle away the bronze with a perfect performance today. Russia, China and Spain ranked first, second and third respectively after yesterday’s competition, are on deck now. Literally. The U.S. did not enter a team this year. Read more about that here. Jordan Burroughs of the United States won his first two freestyle wrestling matches in the 74kg classification, stopping Francisco Soler Tanco of Puerto Rico in the round of 16 and Matthew Judah Gentry of Canada to advance to the semifinals. Burroughs will face Denis Tsargush of Russia in the semifinals at 10:20 a.m. Burroughs defeated Tsargush on his way to last year’s world championship. Tsargush won world titles in 2009 and 2010. Sam Hazewinkel, who lost to Daulet Niyazbekov of Kazakhstan in the 55kg round of 16, will not enter the repechage for the bronze medal after Niyazbekov lost to Dzhamal Otarsultanov of Russia in the semifinals. Wrestlers who lose to the eventual finalists compete for two bronze medals. Julie Zetlin of Bethesda failed to qualify for the rhythmic gymnastics final in the individual all-around Friday at Wembley Arena. Russians Evgeniya Kanaeva, the defending gold medalist, and Daria Dmitrieva finished 1-2 in qualifying for Saturday’s final. Only 10 athletes from the field of 24 moved on to the final; Zetlin finished 21st. John Joe Nevin of Ireland advanced to the gold medal bout in the bantamweight class Friday, beating Cuban Lazaro Alvarez Estrada, 19-14. Nevin will face Britain’s Luke Campbell, a 20-11 winner over Satoshi Shimizu of Japan. The semifinal losers automatically win bronze medals. Nevin and Campbell, who was second at last year’s world championships, will meet Saturday for the gold medal (3:45 ET). Zou Shiming, the defending Olympic gold medalist in boxing’s light-flyweight division, earned a decision over Ireland’s Paddy Barnes in the semifinals — their second straight meeting in the Olympic semifinals — after the fighters tied 15-15 in points over three rounds. The judges said Zou landed a higher number of punches, awarding him the victory and sending Barnes to his second consecutive bronze medal. In the official scoring for that 2008 match, it was determined that Barnes did not land one punch, though replays showed that some of his punches were erroneously awarded to Zou. Zou will face Kaeo Pongprayoon of Thailand, who stopped David Ayrapetyan of Russia, 13-12, in the other semifinal. Jo Aleh and Olivia Powrie of New Zealand won Friday’s medals race, helping them take the gold medal in the women’s 470 at Weymouth and Portland. Aleh and Powrie won the cumulative points race by 16 over Hannah Mills and Saskia Clark of Britain, who got the silver despite a ninth-place finish Friday. Lisa Westerhof and Lobke Berkhout of the Netherlands took the bronze. Americans Amanda Clark and Sarah Lihan finished ninth overall. Competitors in the 470 sailed in 10 races, accumulating points for each finish. The worst finish was thrown out and then total used to determine the top 10 pairs, who competed in one medal race. Points from that race were doubled, added to the points from the previous races, and the winner determined. Tunisia’s Oussama Mellouli made history Friday as the first swimmer to win Olympic gold in the pool and in open water by winning the men’s open-water swim in 1 hour 49 minutes 55.1 seconds. Mellouli won gold in the 1,500-meter swim at the 2008 Beijing Games and took bronze at the distance earlier at the London Games. The silver went to Thomas Lurz, 32, of Germany, the 2008 bronze medalist in the sport’s Olympic debut at the 2008 Beijing Games. Canada’s Richard Weinberger took bronze. American Alex Meyer, 22, was 10th in the Olympic debut. It was the first Olympics for Meyer, a Connecticut native who graduated from Harvard in 2010 and prepared for the competitive ordeal with periodic swims in Walden Pond. World champion Ed McKeever of Britain set an Olympic best in the kayak 200-meter heats of 35.087 seconds Friday at Eton Dorney, then won his semifinal heat to advance to Saturday’s final. Mark deJonge of Canada, who had set an Olympic best in the heat just prior to McKeever’s, won his semifinal and also advanced. American Tim Hornsby qualified for Final B, which will determine places 7-12. In the canoe 200m, Ivan Shtyl of Russia set an Olympic best in the semifinals of 40.346, moving into the Saturday’s semifinals. Yuri Cheban of Ukraine and Jevgeni Shuklin of Lithuania won the other semifinals. In the kayak doubles, Yury Postrigay and Alexander Dyachenko of Russia won their semifinal in an Olympic-best 32.051 seconds, winning their semifinal and advancing to the final. American Carrie Johnson was eliminated in the semifinals of the kayak 200 meters, ending her Olympic career and sending her off to veterinary school at UC-Davis. World champion Lisa Carrington of New Zealand set an Olympic best in the event (40.528) and advanced to the final on Saturday, the last day of canoe/kayak competition. Sam Hazewinkel of the United States fell to Daulet Niyazbekov of Kazakhstan in the 55kg freestyle wrestling round of 16, meaning the best he can hope for is the bronze medal should Niyazbekov advance to the gold medal match. Jordan Burroughs of the United States faces Francisco Soler Tanco of Puerto Rico in the 74kg round of 16 at 9:10 a.m. He might be the Americans’ best hope for another wrestling medal at these Games. The United States has just one so far, a bronze, but Burroughs is the defending world champion at 74kg, a class that Americans have won nine times previously at the Olympics. Americans have won 125 wrestling medals over the years, third most behind swimming and track and field. The men’s Olympic marathon swim has come down to the final lap, and American Alex Meyer appears out of medal contention. Tunisia’s Oussama Mellouli, an early front-runner, has reclaimed the lead and completed five of the six laps around the Serpentine Lake in 1 hour 32 minutes 8 seconds. Germany’s Thomas Lurz is second, and Canada’s Richard Weinberger is in third. The 10k swim, which takes just under two hours to complete, made its Olympic debut at the 2008 Beijing Games. With the men’s marathon swim at Hyde Park’s Serpentine Lake two-thirds complete, American Alex Meyer has fallen back to 12th among the 25 competitors. Setting the pace is Germany’s Andreas Waschburger, who completed four of the six laps in 1 hour 14 minutes 20.9 seconds. In second was Canada’s Richard Weinberger, followed by Oussama Mellouli of Tunisia. Meyer is 10 seconds back of Waschburger (1:14:30.9). The 10k race comprises six laps of 1.67 m each, with the gold medal winner expected to complete it in just less than two hours. Mathew Belcher and Malcolm Page took the gold medal in men’s 470 sailing, giving Australia three sailing golds at these Games. It’s also the second career gold medal for Page, who was on the winning 470 crew in Beijing. Britain’s Luke Patience and Stuart Bithell won silver, while Argentina’s Lucas Calabrese and Juan de la Fuente won the bronze. American Alex Meyer has dropped back to ninth in the men’s marathon swim at Hyde Park but appears to be swimming a controlled, mature race. In fourth after the first lap, Meyer had moved up to third after two laps, one second behind Canada’s Richard Weinberger, who had claimed the lead to cross under the timing gate in 37 minutes, 13.8 seconds. Not every change of position in marathon swimming represents a surge or fade in power, however. It’s as much a tactical race as one of endurance. And smart swimmers adjust their position in the pack for a myriad reasons — to get out of the way of someone who’s banging into them, to ride along in someone else’s wake, to find a moment’s peace from the frenetic throng. The crucial thing is to keep the front-runners within range and stay focused and calm. Tunisia’s Oussama Mellouli, who had dominated the first lap, had dropped back to sixth after two laps but reclaimed the lead on Lap 3. Hyde Park’s Serpentine Lake, normally laden with clumps of algae during summer months, has been cleaned up for today’s event. The swimmers are accompanied by eight pontoon boats of safety officials keeping track of each competitor’s cap and four kayaks. The swimmers’ coaches look on from the far shoreline’s pontoon that serves as the feeding station. At the feeding station, each swimmer has someone extend a pole over the water, with his nation’s flag dangling from the pole to help him find it, that dangles a bottle of water or energy drink. They grab, take a few gulps with one hand while swimming with the other, and toss the bottle. A look at when the gold medals will be handed out at the Olympics on Friday. 7 a.m.: Sailing, men’s 470 medal race. 7 a.m.: Swimming, men’s open water race. 8 a.m.: Sailing, women’s 470 medal race. 11:30 a.m.: BMX, men’s and women’s finals. 2 p.m.: Track and field, men’s pole vault (2 p.m.), women’s hammer throw (2:35 p.m.), women’s 5,000 meters (3:05 p.m.), women’s 4×100 relay (3:40 p.m.), women’s 1,500 meters (3:55 p.m.), men’s 4×400 relay (4:20 p.m.). 2:03 p.m.: Men’s wrestling, freestyle 55kg (2:03 p.m.), freestyle 74kg (2:50 p.m.). 3 p.m.: Women’s field hockey, Netherlands vs. Argentina. 5:15 p.m.: Taekwondo, women’s 67kg final (5:15), men’s 80kg final (5:30). American Alex Meyer finished the first of six laps in the men’s marathon swim in fourth, hugging a single file of front-runners paced by Oussama Mellouli of Tunisia, Canada’s Richard Weinberger and Britain’s Daniel Fogg. This may well be precisely where Meyer wants to be because he’s keeping the leader well within range yet taking advantage of the slip-stream created by the men just ahead of thus, thus conserving his energy for the nearly two-hour ordeal. Most swimmers skipped the chance to get water and gel-pack energy snacks when they passed the dock that serves as a feeding station on the return side of the rectangular Serpentine Lake. Though swimmers keep their stroke motion going while they chug water and toss the bottle, the refueling slows them down and costs them position in the pack. Mellouli, 28, led from the start and set the pace throughout the first lap, which he completed in 18 minutes 9 seconds. Paige McPherson knocked out British world champion Sarah Stevenson in the first round of the women’s 67 kg taekwondo competition. Stevenson had not competed since February after injuring her knee. She was chosen for the British Olympic team by a panel that included her husband. “I saw my family and my boyfriend and that gave me all the enthusiasm I needed,” McPherson said of fighting in front of a pro-Stevenson crowd. McPherson next faces Nur Tatar of Turkey in the quarterfinals at 10:30 a.m. In men’s 80kg taekwondo, two-time Olympic champion Steven Lopez of the United States lost his preliminary bout to Ramin Azizov of Azerbaijan, the tournament’s top seed. Lopez can still earn one of the two bronze medals handed out if Azizov makes the gold medal match, though he may withdraw with an ankle injury. Alix Gerniers and Gaelle Valcke scored goals to lead Belgium to a 2-1 win over the United States, relegating the Americans to last place in the field hockey competition. Paige Selenski scored for the United States, which won only one of its six games in London, a 1-0 upset of Argentina on July 31. Argentina plays the Netherlands for the gold medal on Friday at 3. Britain faces New Zealand for the bronze at 10. Friday’s final synchronized swimming event will be missing something — the United States. The United States couldn’t muster a team for the 2012 Olympics. It did find a couple ladies for Wednesday’s duet competition, where they placed 11th out of 12, and received the lowest scores in actual synchronization. The U.S. ruled synchro in the 80s, with the iconic Esther Williams as its monarch. But the ever-competitive Russians chipped away at the medal stand and now reign over the sport, to the extent that we kinda shoulda just handed them the gold medals this year and saved them some hair gelatin. Russia has won every gold since 2000. In a thoughtful Deadspin blog post last week, writer Aizita Magana — who called this year’s U.S. duet team of Mary Killman and Mariya Koroleva “the great wet hope” — tried to get experts to explain why the U.S. is flailing in the water. It’s a lovely blog post, but you can read the entire thing and you’ll get no answer. So what was it? Endless reruns of Martin Short’s SNL synchronized swimming parody? The absence of boys? The debates over whether synchronized swimming is a real sport? Ethel Merman impersonators at Burning Man? Or is it their bathing suits? During this week’s competitions, we’ve seen Michael Jackson, clowns, soccer balls, sunbursts, wolves, firearms and internal organs on the chests and backsides of swimmers from other countries. Meanwhile, no one can remember what the U.S. wore, except for the Mr. Obvious Olympic-themed outfits on Wednesday. I read an article about Mary Killman and Mariya Koroleva, the U.S. duet, that said they helped design the costumes made by Mary’s mom. I would suggest a little chick-a-boom for the next Olympics. It worked for the beach volleyballers, right? They got half-nekked and got people to pay attention. Mary, there’s an app for that. I think it was meant for 10-year-old girls, so it’s pretty easy and it’s free in the app store. Here’s what I made. Show your mom. Okay, almost time to get serious. The final medal competition for the 2012 Olympics begins at 10 a.m. (Eastern). It’s a gorgeous, sun-drenched day in Hyde Park for one of the more grueling events of the London Olympics: The men’s 10-kilometer marathon swim. Former Harvard swim-team captain Alex Meyer is the lone American among the 25-man field, competing in his first Olympics at age 24. And he’s expected to face his biggest challenge from older, more seasoned competitors Spyridon Gianniotis of Greece, 32, the reigning world champion and a four-time Olympian, and Thomas Lurz of Germany, also 32, the bronze medallist in the sport’s Olympic debut at the 2008 Beijing Games. The 10k swim is a contact sport, particularly at the start, with 100 limbs thrashing in a furious tussle for early position. It should take the swimmers just less than two hours to complete the six laps, marked by buoys, which comprise the 10-kilometer circuit around the finger-shaped Serpentine Lake. Swimmers pass through a timing gate after each lap that records their time. On the final lap, they must pass through the gate and lap to overhead board to register their finish. For Thursday’s women’s event, thousands of spectators stood 15-deep around the lake to cheer Britain’s Kerry-Anne Payne, who finished a heart-rending fourth. The historic Serpentine Lake is situated amid one of the more beautiful settings of the London Games, in the heart of verdant Hyde Park, with Kensington Gardens on its west back and Kensington Palace just beyond.